You might be thinking about upgrading an existing yard or building a garden with a landscaper in Elkhorn. A well-kept backyard increases the value of your property and provides you with a healthy living space. At Heroes Lawn and Landscape, we can help you create the yard you’ve been dreaming about. Our company offers various landscaping services such as design, maintenance, and management to make your garden in Elkhorn more appealing. Perhaps you might be unsure where to begin with your dream backyard. You may set up an appointment with our landscaper in Elkhorn if you want any changes in your property. Before we come up with a design, our landscaper in Elkhorn considers your style preferences. Our landscaper in Elkhorn will create a master plan, depending on the size of the project. For bigger projects, we will work hand-in-hand with you to come up with the best plan for your property. Our landscaper in Elkhorn and in other locations uses up-to-date design technology for landscapes to give you a better picture of the project. 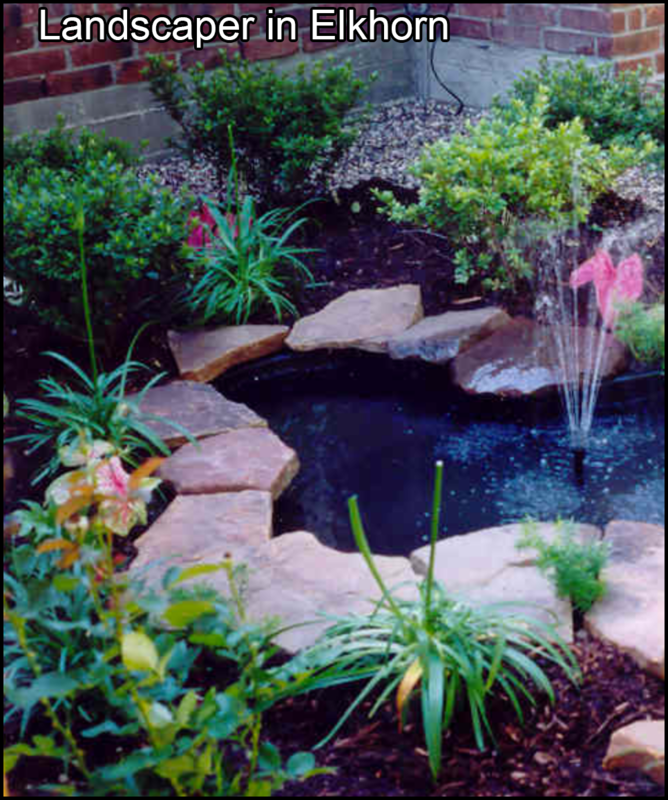 Once you approve the design, our landscaper in Elkhorn leads our crew in building or upgrading your garden. Our crew and landscaper in Elkhorn first examine the condition of the soil and suggest the type of plants that will thrive in your property. With proper installation and care, your plants will continue to flourish with the passing years. To enhance the look of your backyard, our landscaper in Elkhorn works on stone pathways and walls. These structures complement the growth of plants. In particular, a well-maintained wall prevents sloping and soil erosion. With a landscaper in Elkhorn, your retaining walls can be renovated or redesigned to retain soil and add aesthetic value to the landscape. Depending on your preference, a landscaper in Elkhorn can build brick walls, segmental and block walls, and dry-stacked stone. Having a small outdoor space is a common problem among urban dwellers. A landscaper in Elkhorn can come up with different solutions so that you can make the most out of your limited outdoor area. For example, a landscaper in Elkhorn can design an elevated patio to make the yard appear bigger. You may have your hands full with work and family. Perhaps maintaining your backyard is the least of your priorities. Our landscaper in Elkhorn understands that. Apart from landscape design and hardscape construction, a landscaper in Elkhorn offers landscape management. With the help of an experienced staff, our landscaper in Elkhorn saves you the trouble of edging, pruning, and treating the plants in your yard. Mulching. This procedure keeps weeds from growing in your yard. Pruning. This prevents other plants from growing into your yard. Tree and Shrub Care. This protects shrubs and trees from pests and ensures the healthy growth of your plants. Well-maintained plants can improve the look of your yard. For your backyard projects, reach out to a landscaper in Elkhorn today. Heroes Lawn and Landscape can build your dream outdoor area. We specialize in various services to maintain the beauty of your yard. Set up an appointment with our landscaper in Elkhorn. You can also visit our website at http://heroeslawnandlandscape.com. Heroes Lawn and Landscape is a company that brings new meaning to the term, “full-service.” We are much more than just a landscaping company in Elkhorn. Apart from landscape design, we also offer landscape care, maintenance, mosquito control, and holiday lighting services for your Elkhorn home. We know how tedious it is to have to hire different companies in Elkhorn to handle all aspects of landscaping, landscape care, and outdoor lighting. Our goal is to save our clients time and energy by providing a one-stop solution to all of their outdoor improvement and maintenance needs in the Elkhorn community. The patch of land behind or in front of your house in Elkhorn can serve a wide range of purposes. With our help, it can become an extension of your home or a showcase for your ornamental plants. We can turn a humble Elkhorn backyard into an outdoor entertainment area by installing a custom-designed patio, and make hard-to-reach outdoor areas more accessible by constructing garden paths. By installing hardscapes in your Elhorn home such as retaining walls and steps, we can make your lawn or yard more functional and visually appealing. Heroes Lawn and Landscape was founded by four friends. They noticed that home and business owners had to go to different companies for yard care, holiday lighting, and other landscape improvement and maintenance services. To meet the need for a one-stop solution, these friends established Heroes Lawn and Landscape in 2014. From an idea among friends, our company has grown to a full-service company serving Elkhorn, NE and surrounding areas. In 2016, we were awarded Thumbtack’s Best of 2016. Do you want a new look for your outdoor spaces? Turn to Heroes Lawn and Landscape for expert landscape design and maintenance services. Our team has the skills, experience, and equipment to implement a full-scale landscape design project for residential and commercial Elkhorn clients. We meet with our clients first so we can fully understand their goals. Also, we provide regular updates throughout the course of the project to ensure that our clients and our team are on the same page. Our seasoned installation crew will deftly and efficiently bring your plan to fruition. Afterward, you can opt for our maintenance services to ensure that your landscape’s features look as amazing as the day they were installed at your Elkhorn home. Winters in Nebraska can be harsh. If you live in the area, you’d know that shoveling snow is time-consuming and back-breaking work. Not removing snow, however, can cause even more problems in any area of your yard. Our service uses products that are strong enough to eliminate ice without damaging concrete or vegetation. What’s more, during the winter season, we are on call 24 hours a day, seven days a week. At Heroes Lawn and Landscape, we pride ourselves on our ability to provide our clients with the services they need to keep their lawns and yards attractive, functional, and safe. Our exceptional service, workmanship, dedication to customer satisfaction, and innovative approach to landscaping are just some of the many things that set us apart from the competition. Learn more about how we can transform your outdoor spaces into showcases by giving us a call. You may also request a quote by filling out our online form. We look forward to helping you achieve the lawn or yard of your dreams, contact your landscaper in Elkhorn.